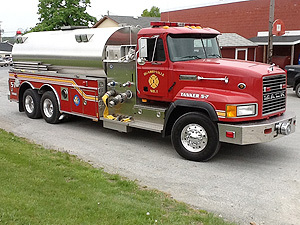 This unit has a 3,500 gallon tank with a 2,000 GPM pump. 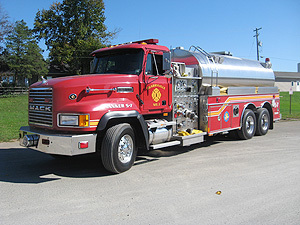 The tanker has two 10"side dumps and one 12"rear dump that can be operated from the cab or on the outside of the tanker. A cab mounted back-up camera is also installed for driver assistance. The tanker has 650 feet of attack line and 200 feet of supply line. This unit also carries general structural firefighting tools. This unit was refurbished by Swab Wagon Company in 2011.